Leonard Cohen is to play a one-off outdoor show in the UK this summer - with a mammoth set lasting more than three hours. The 77-year-old Canadian, famed for songs such as Hallelujah, I'm Your Man and Suzanne, will play at The Hop Farm in Kent on September 8. It will be his only UK show of the year and will feature classics as well as tracks from new album Old Ideas. 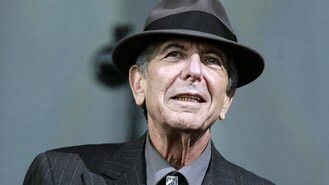 Promoter Vince Power said: "To get the opportunity to bring Leonard Cohen to the UK for his only appearance this year is a fantastic and humbling achievement. "He is one of the undisputed forefathers of modern folk music and has honed his craft for nearly half a century." The venue at Paddock Wood also hosts the Hop Farm Music Festival in June. Tickets go on sale generally on Friday. Labrinth insists that he prefers tea and crumpets to showbiz parties. Cheryl Cole and Louis Walsh appear to have called a truce after their very public war of words. Bee Gees star Robin Gibb was too ill to attend the London premiere of The Titanic Requiem, his first classical work, his son has said. Florence And The Machine and the Red Hot Chili Peppers will be among those headlining this year's three-day Lollapalooza music festival in Chicago. Lady Gaga has announced two UK dates - when she will be supported by glam rockers The Darkness - as part of her world tour. One Direction's Harry Styles is not dating US singer Lily Halpern, his spokesperson has insisted. Cher Lloyd has revealed she wants to "smash open some doors" in the US. Nicki Minaj could be upping sticks for a leafy English manor, according to reports. Rihanna has revealed she has started thinking of ideas for her seventh album.